Russian cartoonists are turning to the internet to publish political cartoons that newspapers are shying away from printing. Press have been increasingly scared to criticize President Dmitry Medvedev and Prime Minister Vladimir Putin and even local government. Unlikely to see their work in print, cartoonists post their drawings on sites such as www.Umorist.ru, www.kremlingremlin.ru or www.caricatura.ru to comment on Russia’s political news and the country’s leaders. 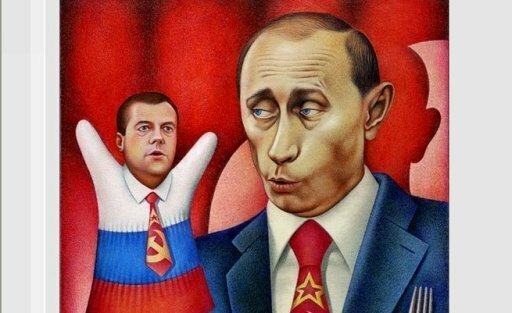 Much of the satire is aimed at Putin’s and Medvedev’s relationship, often hinting Medvedev is nothing but a puppet of Putin. This isn’t the first time media has been afraid to criticize Putin. The satirical puppet television show Kukly, or Puppets, which was wildly popular in the 1990s, closed down soon after Putin became president. It included a grotesque Putin character. The most likely place to see such speech is at a museum and even at a recent exhibit Russia and the United States: Political Cartoons Yesterday and Today those were few and far between.